You prolly heard that NIKE has replaced Adidas as the league’s official apparel provider. But there’s more to this story than meets the eye. And some of it is, at least a little, disturbing. The Good: Adidas is rightfully known the world over for their superior uniforms…well, soccer uniforms. (Make that football or futbol, depending, you know…) The brand is almost synonymous with the sport. But, being as gentle as I can, their basketball uniforms are really awful. Not the construction, but the design, the style. Or lack thereof. For a sport that plays best to the sounds of a back rocking beat, Adidas uniforms have always had the starched look and feel of Bach’s Fugue in G minor. 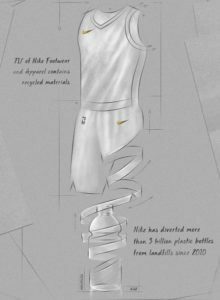 Each uniform represents approximately 20 recycled PET bottles. NIKE will undoubtedly up the game on the design & style front. That’s good. The Bad: Lock the doors and bar the windows, Home and Away are going away. Huh? NBA teams will no longer have home and away unis. Yep. They’ll instead have 4 primary unis to choose from on a nightly basis. (home team selects; away team contrasts). In other words, the traditional home team being in white is no more. If this creeps into tournament play, look out. To add more confusion, the new NBA unis will come from 4 different patterns with overly earnest names like “The Community”, “The Icon”, “The Association” and, I kid you not, “The Athlete’s Mindset”. I’m sure this will get even sappier as time goes by, with add-ons like “The Healer” or “The Power of Love” or some such crud. At Team Sports Planet, where we originated the concept of “package names” close to 20 years ago, (when the industry was fine with hot selling styles names like the “BBJ9” and the “54MMR”), we’ve always tried to have fun with the idea (e.g., “The Big Smooth” and “Press Breaker”) because, well, fun is good. Like team sports. The new naming convention for NBA uniforms. Many of the folks on sports blogs have called out NIKE for, frankly, exactly what this is: A naked grab for more money in apparel sales. Why have home, away and alternate (just 3)? When 4 increases revenues by potentially 25% with stroke of a pen. The NBA and its team owners, neither one known to shy away from a new shiny nickel, needed almost no further convincing. 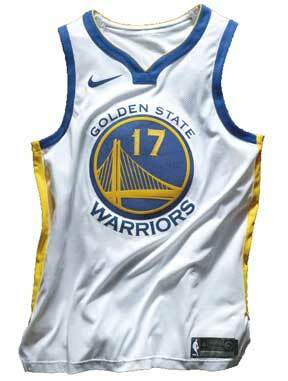 The Ugly: How god awful these new uniforms will actually look in each NBA city hasn’t been revealed just yet (the Golden State uni they showed was…meh), but what they also didn’t show was corporate logos. No, not the “swoosh” but other company’s logos. Remember this is the year that the NBA adds ADS to the uniform design mix. Like NASCAR and soccer, which are fine as such. But do the storied franchises of the NBA (Lakers, Celtics, etc.) really…really need to besmirch their brand identity by having a logo for Pepsi, Rolaids or, god forbid, Cialis right there on the uniform?!?!? 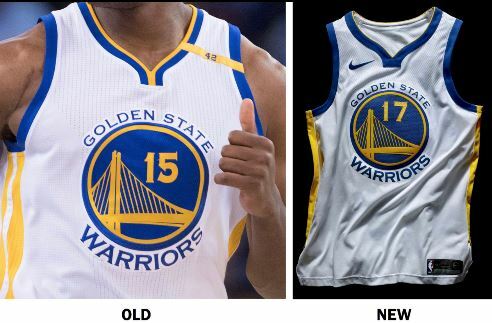 This development alone may take the new NBA unis beyond ugly, past fugly and right on into hideous.